Note: Lovely itinerary with beautiful nature, especially the part near the cooling river.We recommend taking the 6a) by foot and the 6b) by bike.Although the part of the itinerary, which goes from the Ferriera to the spring, meansthat the bike has to be pushed. This hard work is re-paid when we can pedal for the restof the trip, which is very pleasurable and not to much hard work. The asphalted partof the road, although it is not much used by cars, can be quite hard work by foot. 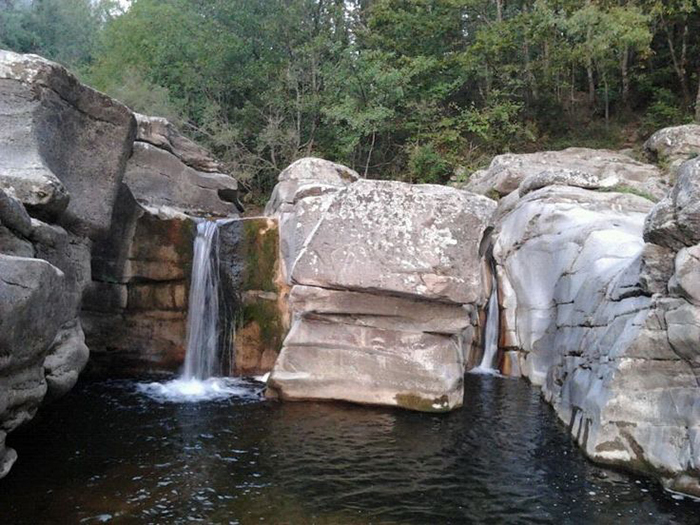 Farma Nature Reserve, situated between Monticiano and Roccastrada, includes the middle stretch of the very beautiful and wild valley where the stream Farma runs, the main tributary of the river Merse, and the upper course of Lanzo, a long stream flowing into the river Ombrone at Paganico. Before entering the hamlet of Scalvaia, in front of the cemetery we join a gravely roadto the left and immediately after the first junction we keep left and descend until wereach a weigh bridge and the San Biagio fields. Now the road continues slightly incliningand declining with junctions on the left and right. One of these, after about 2 kmfrom the beginning of the walk takes us to the Poderone ruins. We carry on along themain road, and pass a clearing (“Croce a Console” sign), and continue for about another200m, until we see a new junction marked by a “Ferriera” sign. A gate with a chaincloses the right hand junction.The chain can be passed by sideways and descend following the windy road. Afterseveral bends we reach the Farma River. Taking a right, we cross a field and reach theFerriera dam ruins (emergenza storica on the map), the dam makes a pool in the riverwhere we can swim. From here the footpath continues, not always so visible, climbingon the orographic left of the river.At this place, woods are characterised by the unusual presence of many different species.Typical mediterranean undergrowth plants grow side by side with hornbeam,maple and manna-ash, and on the orographic right of the river, a yew-tree forest. The yew is normally present over 800m, but in a microclimate that has remained unchangedfrom the last ice-age to the present day, especially in the side exposed north, it canlive at about 200m above sea level. For a while the footpath climbs taking us away momentarily from the river offeringspectacular glimpses of the valley (emergenza naturalistica on the map). After around300m, the path begins its decline taking us back to the river. The nearby river is heardby the sounds of running water. Before the footpath starts to climb, a road to the left,indicated by a red and white sign, takes us, after 100m to the Canaloni. A 150mstretch of river is characterised by a marvellous pools and waterfalls. Here it is alsohard to resist a swim. The rocks that form the Canaloni, are the oldest (about 350 million years old) inTuscany, and are known as the “Poggio al Carpino” formation, the name of the hillimmediately to the north of the Canaloni which borders the Farma river on its left.Quartz veins that fill the fractures in the rocks form beautiful paterns. We return onto the original footpath and following alongside the river we cross acouple of ditches, which can be more or less muddy, depending on the season. Afterabout 1 km the footpath passes very near to the river, which forms a large creek (emergenzanaturalistica on the map). Where the grass is longer and lush it is easy to find anatural water spring. After the creek, the footpath takes us away from the river and wereach a clearing bordered by hazelnut trees and finishes becoming a gravely road. Wefollow the road on the flat, passing by paths and tracks on the right leading to the forestand on the left leading to the fields. After around 1 km of road and a little after a smallglimpse of the Torniella village, we have 2 alternatives. 6a) We take a well-hidden path to the right, (the junction is indicated by a post) andruns along the bed of a ditch. The rugged path climbs into an oak forest. We pass by2 roads on the right (in descent) and we follow the footpath, still climbing. The forestis mixed with oak trees, chestnut, evergreen oaks, arbutus strawberries, and heather andpines. We reach a small clearing (450m above sea level) where the footpath becomes aforest track where, after about 400m we reach the hamlet of Scalvaia, after crossing achestnut woods, on the right side of the San Biagio church (8th century). 6b) We continue on the gravely roads until arriving after 2 km to the SS73 Senese-Aretina main road near to the Farma bridge. Taking a right, after about 3 km, we reachthe junction, which takes us to Scalvaia. Monticiano is a very ancient village that lies on the edge of the Tocchi State Reserve and is surrounded by the Nature Reserves of Alto Merse and Farma. Nature is the strength of this area, which includes lush forests where you can walk or ride on horseback surrounded by an extremely rich array of flora and fauna. The river Farma is the most important affluent of the wider river Merse and divides the two provinces of Siena and Grosseto. The Petriolo hot springs are immersed in a beautiful wood where you can relax and swim in the wonderful hot baths of this natural sulphuric water basin. The water emerges at 43°C on the banks of the Farma river. The strong sulphurous smell is due to hydrogen sulphide. 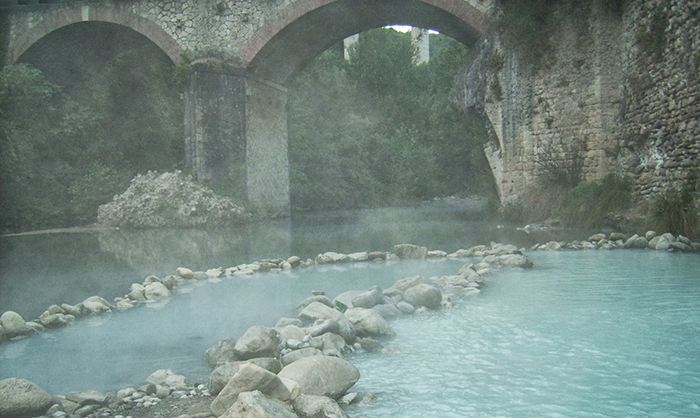 This gas, thanks to its sulphuric properties, make Petriolo Thermal Baths rich in mineral salts. Already known around 1200 for their therapeutic effects, the springs were used by many illustrious figures, among them the Medici, popes and cardinals and nobles from the Siena. I canaloni are a stretch of about 150 m of river characterized by a marvelous alternation of waterfalls and bars, while framing this is one of the oldest rocks in Tuscany (about 350 million years). The river Farma became an industrial centre for the working of iron. The most important ironworks, which we will visit, used to be known as the Ruota (‘wheel’) and is now called the Ferriera. The whole building can still be seen, as well as a dam for the collection of water a few hundred metres upstream.